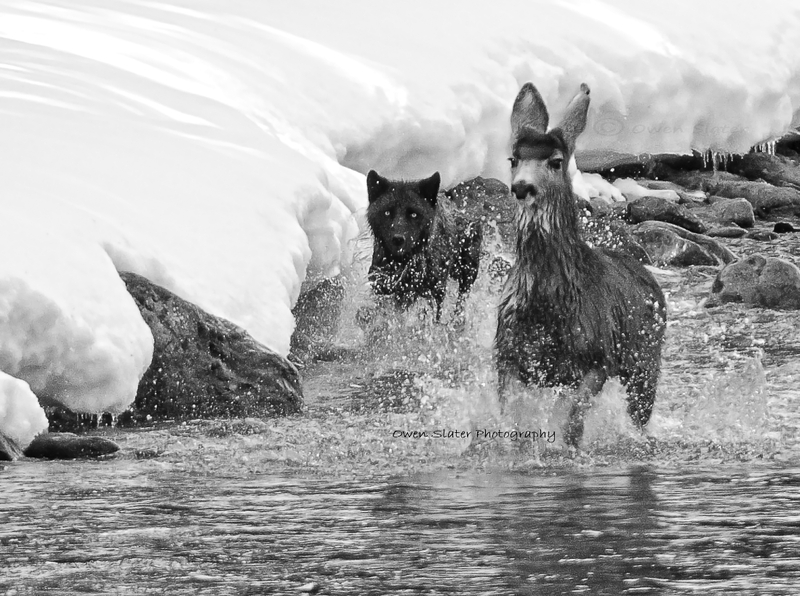 For those familiar with the Bow Valley Pack of wolves in Banff National Park, it has been a very unusual winter. 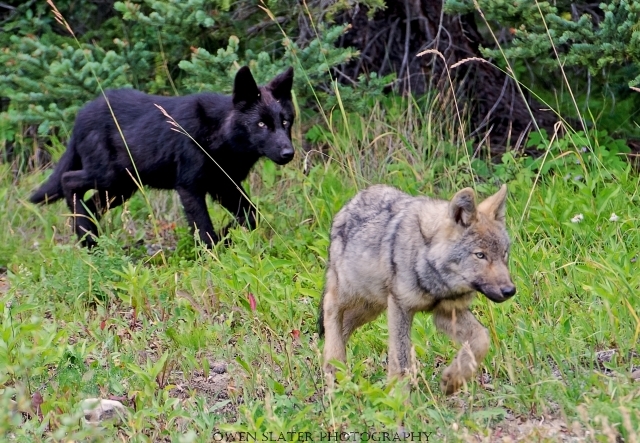 At this time of year with luck, persistence and knowledge of wolf movements, it’s not uncommon to come across the pack of wolves that frequents the Bow Valley. 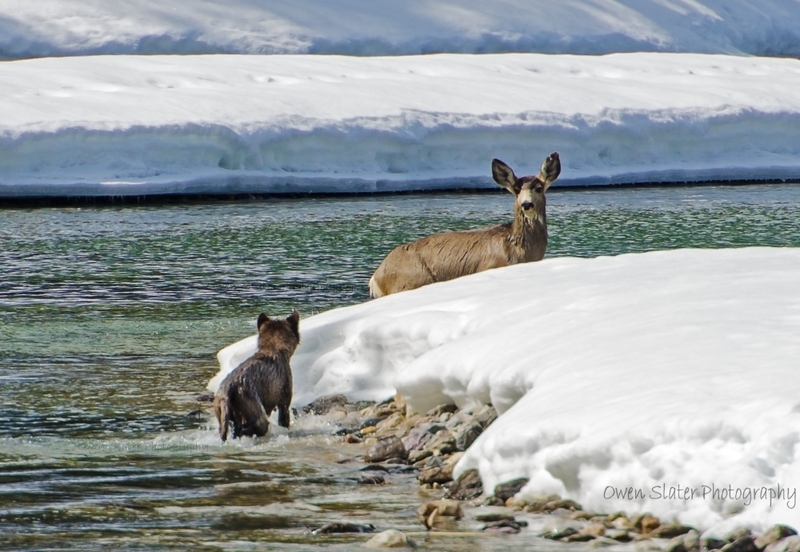 Each winter they travel throughout their territory between Banff and Kootenay National Parks. 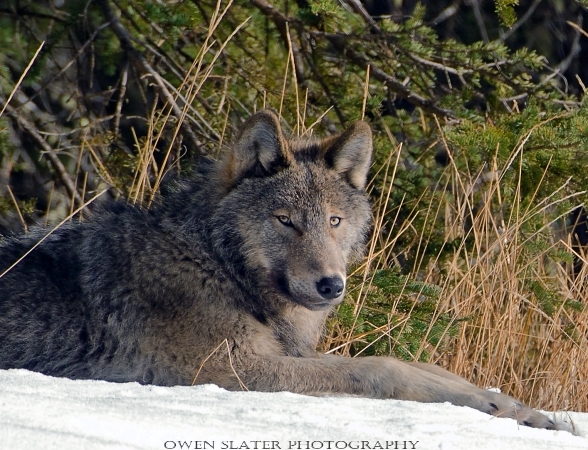 This winter the pack appears to have splintered with what appears to be only a few juveniles remaining. No concrete information on what has happened to the breeding adults (known locally as ‘Faith’ and ‘Spirit’) has surfaced, but with no sightings of them over the past several months the most likely explanation is that they are no longer alive. Both were getting up in age with each estimated to be around 9 and 11 years old. In Spirit’s case, his canine teeth were worn down almost to the jaw line and after most hunts it was not uncommon to see him and Faith limping around for several days or weeks. 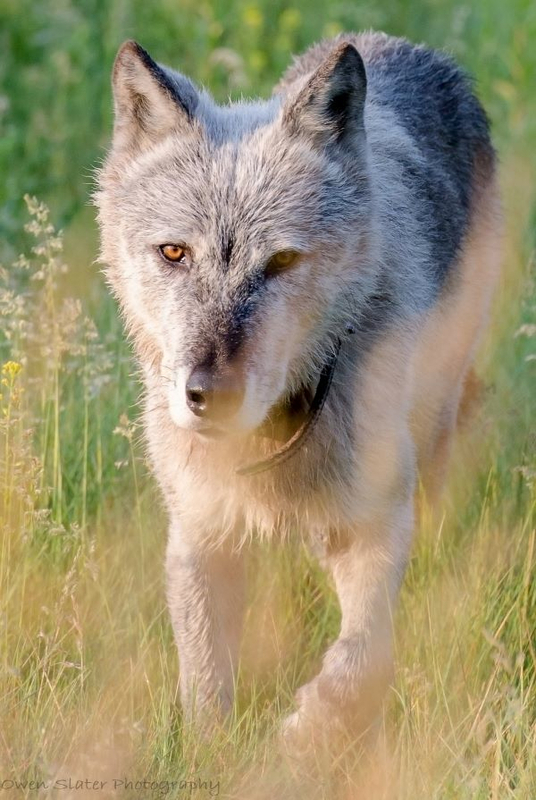 Only three wolf pups were born in 2014, down from their usual number of 6, which was another indication that their time as the resident pack in the Bow Valley was coming to an end. If indeed they are no longer alive, it will take a while before a new wolf pack moves in and gets established. 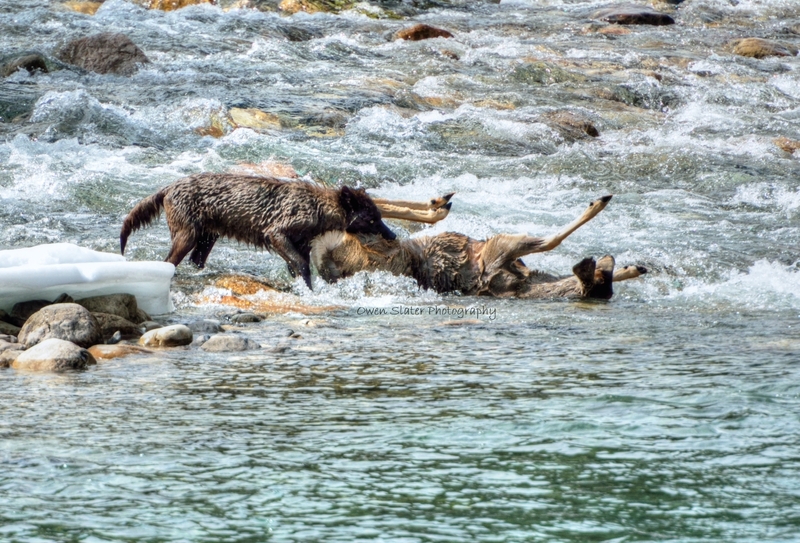 Time will tell, but for the moment it seems the wolves of the Bow Valley are in a state of flux. Would you like to directly impact the future of a critically endangered species? Currently, the US Fish and Wildlife Service is in the process of determining if the Red Wolf Recovery Program will continue. This project has great personal significance to me, given that I was directly involved in efforts to save this species. In 2009, while working at Lincoln Park Zoo I flew from Chicago with four, 1 week old red wolf pups in a carry-on suitcase! 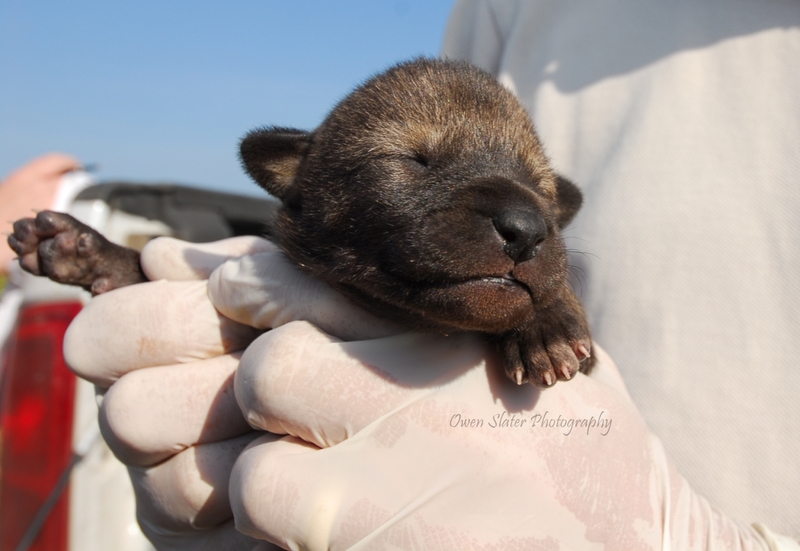 We were head to Alligator River National Wildlife Refuge in North Carolina to link up with biologists to cross-foster the captive born pups into wild red wolf dens to bolster the wild red wolf population. Click here for my 2009 travel blog featured on Lincoln Park Zoo’s website with lots of photos. This species is one of the most endangered carnivores in the world (only about 80-110 in the wild) and drastic measures were and are needed to save it. With the intensive conservation measures mentioned above the population is slowly increasing but more work is required. Additional information on the Red Wolf Recovery Program can be found by clicking here. 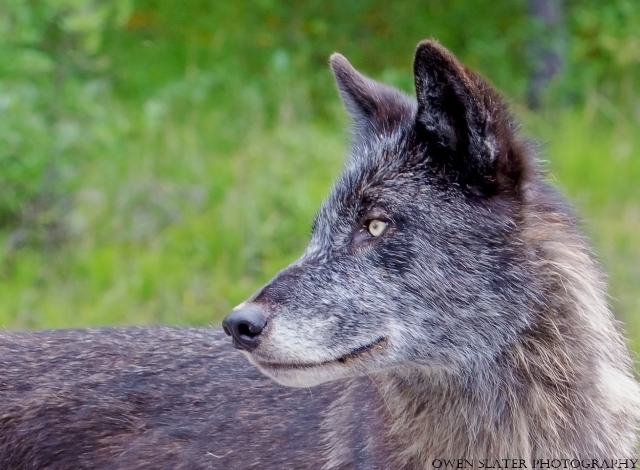 I came across this gray wolf in Muncho Lake Provincial Park in Northern British Columbia. 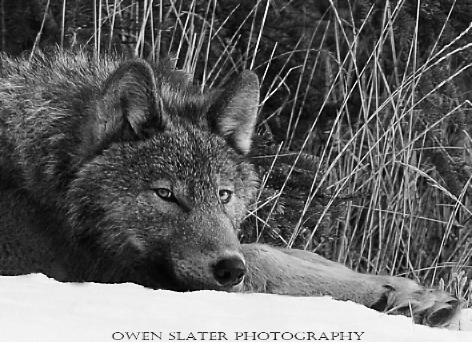 If you spend any time photographing wild wolves, they make it clear from their body language if they are relaxed with you around. This 2-3 year old wolf (based on body size and teeth condition) could have cared less that I was just a short distance away. It kept its ears forward, jaw relaxed and pace at a slow trot, paying no attention to me while scanning the clearings for any caribou or stone sheep. The entire sighting was over within a few minutes as it disappeared into the trees, but like with any wolf encounter, it left me with an adrenalin rush that kept me going for the rest of the day. Powerful, intense, resilient and beautiful. To me the wolf symbolizes nature and wilderness as it’s meant to be. I took this photo on one of my recent trips into the Canadian Rockies! Feel free to share and/or comment and as always, please click on the image for the full size! Seeing and photographing wild wolves is always a thrill, even more so this year since finding any has been a lot more challenging. On the few occasions when I have been lucky the glimpses were always fleeting or with lots of trees and bushes obstructing my view. On one day late in August I got my best glimpse this year. Some of the pack was resting deep in the forest near a kill site and the only way I knew they were there was from the periodic howling. After awhile I noticed some movement between the trees and it soon became clear they were on the move. I had a pretty good idea of the path they would take and where they would come out of the forest for a few seconds so I drove ahead a few minutes, parked my car and set up my camera. With the settings dialed in, I didn’t have long to wait. The two year old female emerged from the trees and came trotting along the clearing. She stopped not too far from where I was parked, turned and looked behind her as if waiting for something. It didn’t take long to see who it was. One grey and one black pup soon appeared and followed in her footsteps through the clearing. With the pups close behind I only had a few seconds to get some photos before the adult lead the pups back into the forest and out of sight. 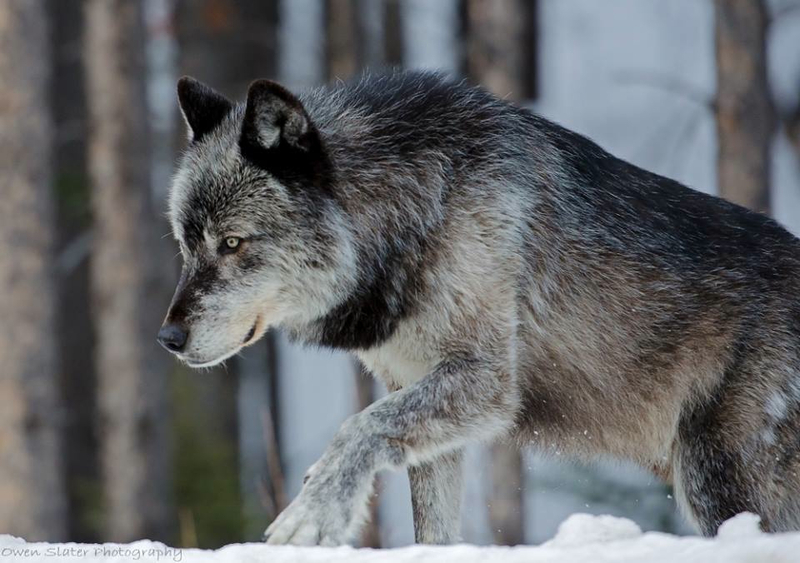 The last remnants of a winter coat cling to the neck and sides of this wolf as he makes his way along the rocky banks of a river. With only small amounts of snow remaining on the mountain peaks, wolves become even more like ghosts of the forest during the summer. Coming across them is always, to some extent based on luck and usually the glimpses are very fleeting. With the sunlight trickling through the trees I only had a few seconds to steady my camera and get this photograph before it disappeared back into the dense understory of the bush. Such remarkable and elusive creatures! 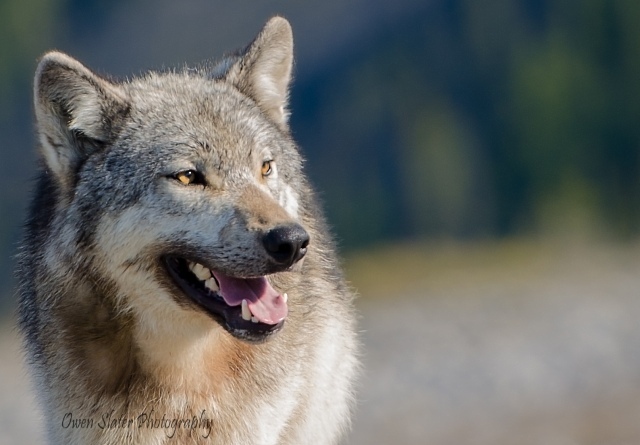 The trip to Yellowstone wouldn’t have been complete if I didn’t get a chance to photograph wolves. On the second morning we lucked out and came across the Junction Butte pack. We had seen them the day before but through a spotting scope since they were a few kilometers from the road. Overnight the pack must have traveled a fair distance, but as luck would have it they were right next to the road. This one was slowly making its way through the sage brush right past a herd of adult bison. The bison clearly knew how to behave around the wolves as they stood their ground and just stared at the wolves who quickly determined that they should keep going. As the sun crested the hill, this wolf paused for a few seconds to see where the rest of the pack had gone giving me the perfect opportunity to get a few photos. I guess I spoke too soon in my recent post about this wolf helping the pack with puppy chores in the spring. 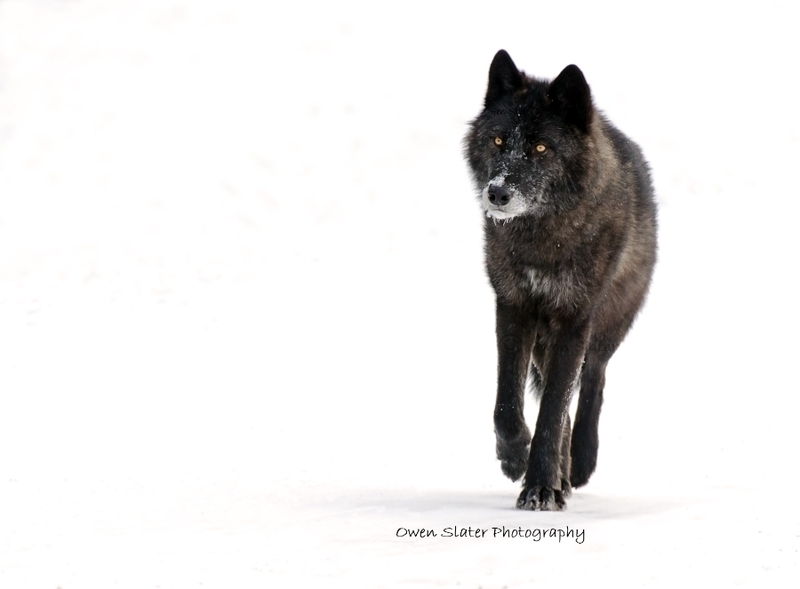 Just a few days ago, on the morning of Friday, April 5th this wolf’s life was cut short by a CP train in Banff National Park. The young male was just shy of its one year birthday. It really shouldn’t come as a surprise to anyone that it was killed by a train, after all this has been a routine event in Banff for years now. Trains remain the number one killer of Banff grizzly bears and in the past year numerous black bears and several wolves have also met their demise on the tracks. This is not even mentioning the elk, deer, moose and coyotes. Everything from the smallest birds to the largest mammals are commonly hit by the trains as they travel through the park. 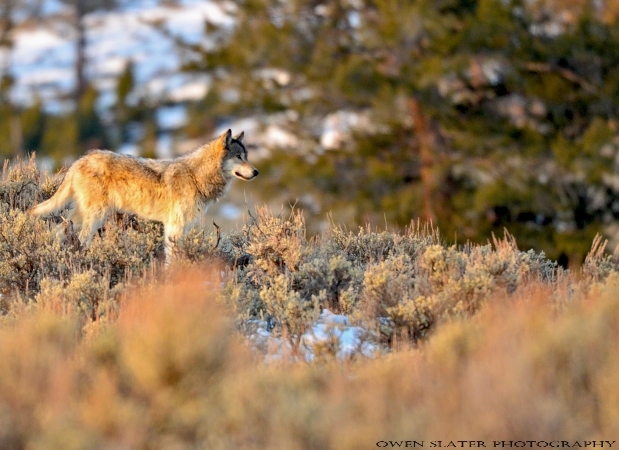 The pack that this wolf belonged to has 2 of 6 pups remaining from last years litter. Only 1 of 7 pups from the previous year has survived. Of the two surviving 1-year-old pups, one was hit by a train in late fall while she and the rest of her family were feeding on a rail killed deer carcass next to the tracks. Somehow this wolf managed to survive the strike and miraculously has made it through the winter and appears to have almost completely healed from what I suspect was a fractured left hind limb. Of the seven pups born the previous year all but the surviving wolf were either hit by trains or cars. Efforts continue between Parks Canada and CP Rail to research the factors that influence these train mortalities. While it’s great that they have committed time, money and staff to this problem, the fact remains that train caused wildlife deaths in the park have occurred on a frequent basis for years and despite some attempts to address the problem, it continues to happen on a very regular basis.The vacuum truck that is supposed to remove the grain spills doesn’t seem to come along the high risk areas of the tracks during the winter and it would seem that grain spills, which as you will see are pretty obvious, go unreported. Wildlife-train collisions are also not always reported and the strikes that are reported are not always appropriately removed from the tracks. Add in that parks staff have been cut thin to the point that they can’t always adequately respond to all the human wildlife conflict events in a timely manner and several other variables that are a product of chronic underfunding and we have a recipe for more wildlife carnage. One has to see the hypocrisy that signs in Banff state it’s illegal to feed wildlife and yet these trains are doing just that, like a giant cafeteria conveyor belt. Expecting others to act responsible while allowing this to occur is a perfect example of do as I say and not as I do. 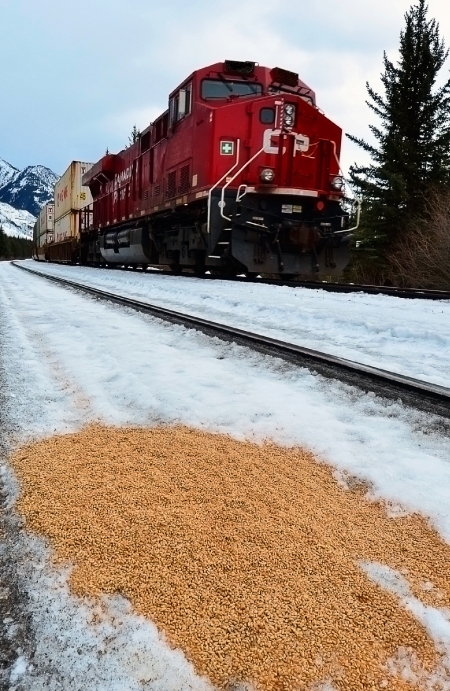 While it is simplistic to say that all the train mortalities are caused either directly or indirectly from the grain, one has to accept the fact that even if grain or other food attractants aren’t present at the time of the event, animals will still travel the tracks looking for the free handouts whether they are there or not. After all, this has become a learned behaviour passed down from generation to generation. They have been condition from the time they are old enough to walk or fly that the tracks offer a steady supply of food so one cannot truthfully state that a particular train mortality wasn’t associated with grain or a carcass simply because these attractants weren’t present at the time of death. This is misconstruing the root of the problem. It will take years of continuous negative feedbacks for animals to stop coming to the tracks to look for handouts. The reduction in spillage to current levels is a start but breaking this pattern will require no less than complete prevention of these spills and quick removal of any carcasses from the area. Only then will researchers be able to tease apart the other minor factors that might be at play. In the grand scheme of things this is only one more human induced wildlife death in the long record of deaths that have happened in Banff and all along the tracks from Saskatchewan to Vancouver. However, it should serve as a prime example to every stakeholder that sooner than later added actions are required to address this problem and there is no better place to start than in Banff. Parks and CP rail should not simply state ongoing research will be used to investigate possible solutions. Short term solutions are required now while the longer term options are investigated. However, the buck doesn’t just stop with them. Instead of visitors just complaining about all the most recent deaths and demanding something be done, they too should take actions of their own. If you are a visitor to the park and are walking near the tracks, report any carcasses, grain spills or any other concerns to Parks by calling Banff Dispatch at 403-762-1470 (24hrs/day). Even better if you can follow-up to make sure that the problem has been addressed and if it hasn’t, report it again. Every time a call is made a paper record is created that must be reviewed by Parks Canada management to make sure that the problem is taken care of. Other options include photographing what you see and forwarding it along or contacting Parks and CP staff directly with your concerns. My hope is that this most recent death helps initiate more concerted efforts by everyone to actually solve this decades old problem. One can still hope can’t they? 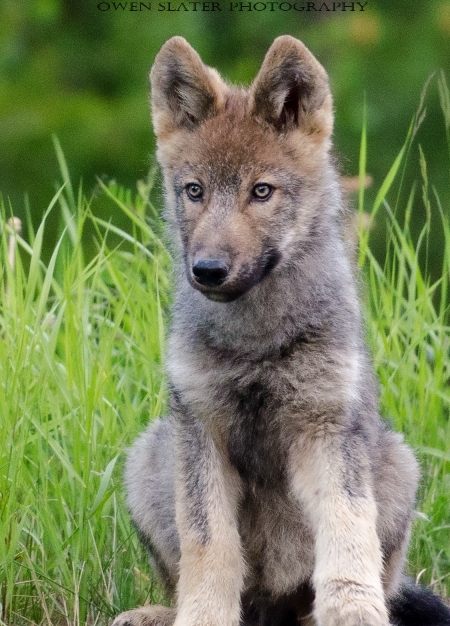 A 3 month old grey wolf pup takes in its surroundings after recently leaving the den. Seven months later he has grown into an impressive animal with thousands of miles under his feet and has learned how to hunt deer and other small prey on its own. Over the coming months he will be relied upon to help provide food, puppy sitting duties and protection for a new litter of pups. Fast forward to last week for this image (please click on the photo for the larger version). For anyone that has had the privilege of seeing wild wolves in their natural environment, you can appreciate how fleeting the glimpses usually are. Often times they are visible for only a few seconds, usually in poor light with something obstructing the view. In these situations I often won’t even bother trying to take pictures. I will just watch them from a distance and enjoy the moment before they vanish into the forest. Last week I was having a very unproductive morning with no good wildlife sightings to speak of so I decided to start heading back to town. I rounded a corner and my luck drastically changed. There, basking in the mid-day sun were three wolves! It is very rare to see them during the day and for them to be lying out in the open is exceptionally rare! I quickly pulled my car over to the side of the road, rolled down the window and turned the engine off in the hopes that I wouldn’t disturb them. Thankfully, within seconds they relaxed and went back to lounging in the sun! 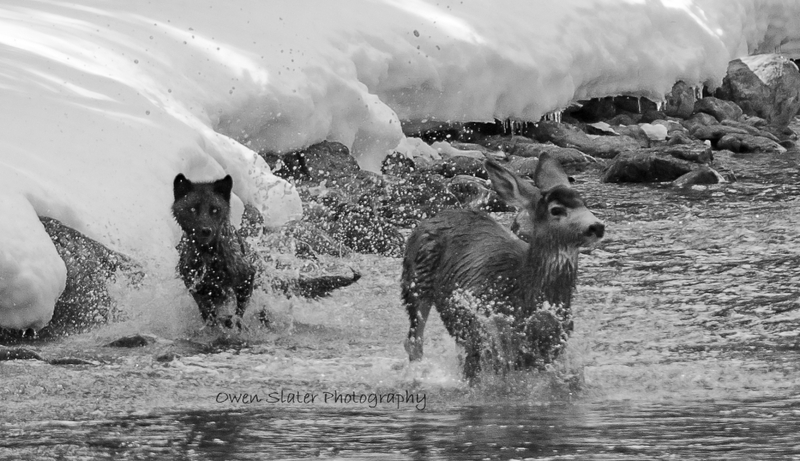 To me nothing is more rewarding when watching wildlife then to have them be seemingly unaffected by my presence. I think this should be the gold standard for anyone that wants to watch or photograph wildlife. Sometimes it doesn’t happen, but if an effort is made to make this the first priority then it will occur a lot more often than not. In this case by keeping my distance, staying in the car and making as little movement or noise as possible I was able to watch them undisturbed for several minutes. One walked down the hill right in front of me while these two stayed on the ridge above. The two on the hill would periodically lift their heads to check on the other wolf below. The most amazing moment that illustrated that they weren’t concerned with me in the least was when they laid their heads down and closed their eyes for a few moments. To me this was the ultimate compliment. You might be wondering how it all ended? 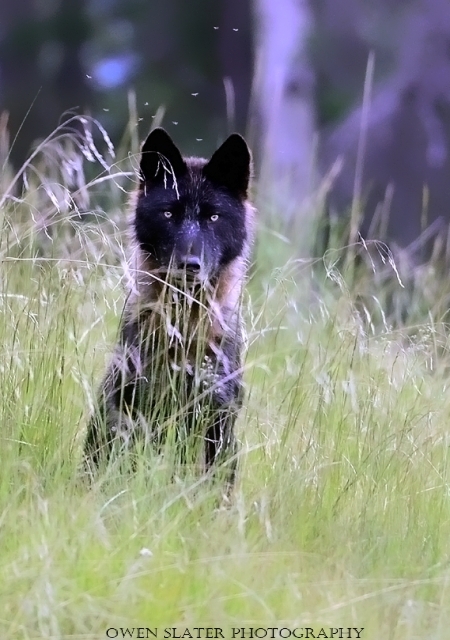 I wish I could tell you that I left the wolves were I found them but unfortunately as is all too common these days a vehicle came around the corner, stopped behind me and the person got out of their car. In a split second the wolves on the hill leaped up, swirled around and vanished into the trees while the one of the road bolted up the hill and out of sight. Frustrating to say the least but hopefully the wolves were able to find a more secluded sunny spot to rest in for the remainder of the afternoon. Let’s continue to ease back into the winter photography. Here is one from my bank of images taken in the summer. 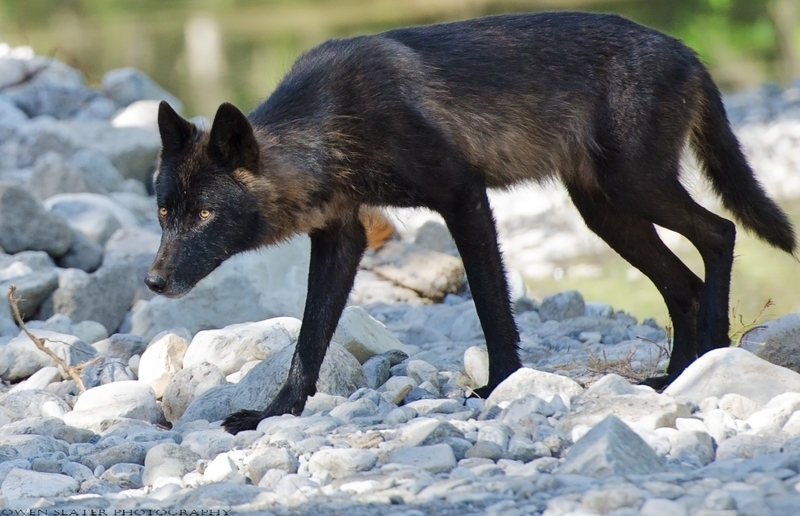 The predator and prey roles are reversed when a ‘pack’ of hungry mosquitoes descends down on a wolf. They are mostly kept at bay by the thick coat, but just like when a wolf goes in for a kill, the mosquitoes hone in on the most vulnerable spots where their prey is less likely to be able to defend itself. The wolf didn’t seem to be too bothered. I on the other hand was cursing at them under my breath. The welts that I soon developed and the itching that happened for days afterwards was a small price to pay. It almost makes me appreciate the long mosquito free winters. Almost! A radio-collared wolf pauses to survey her surroundings before plowing through the deep snow. While looking ahead she used one ear to listen for members of the pack following behind as they co-ordinated their movements up a hill in search of prey. From Little Red Riding Hood to present day, the wolf is often given an image that is not even close to factual. Hollywood continues to portray wolves as human killers (eg. the latest Jason Bourne film) and groups advocate for open hunting seasons because they feel the wolf is killing all their deer or free ranging livestock. 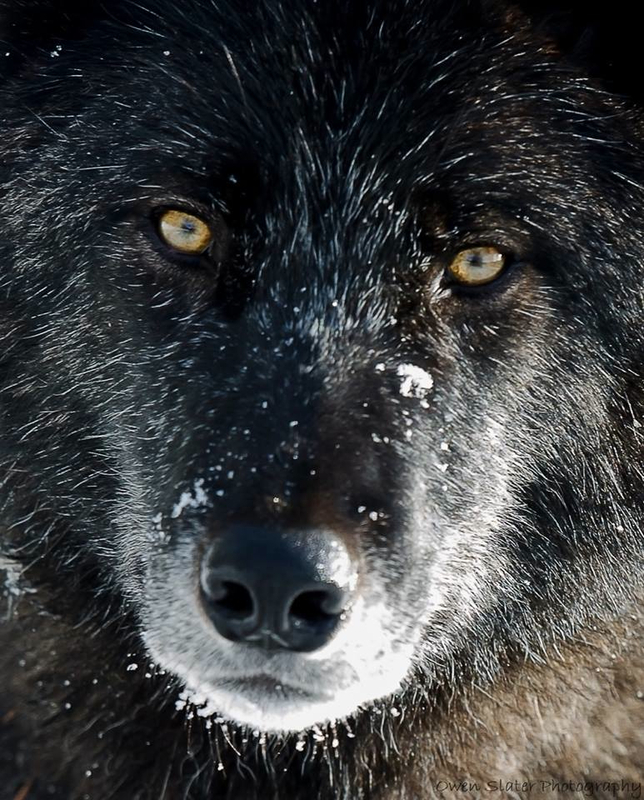 On the other extreme are the advocates that think wolves can do no harm. As usual, somewhere in between these two extremes is where the wolf belongs. 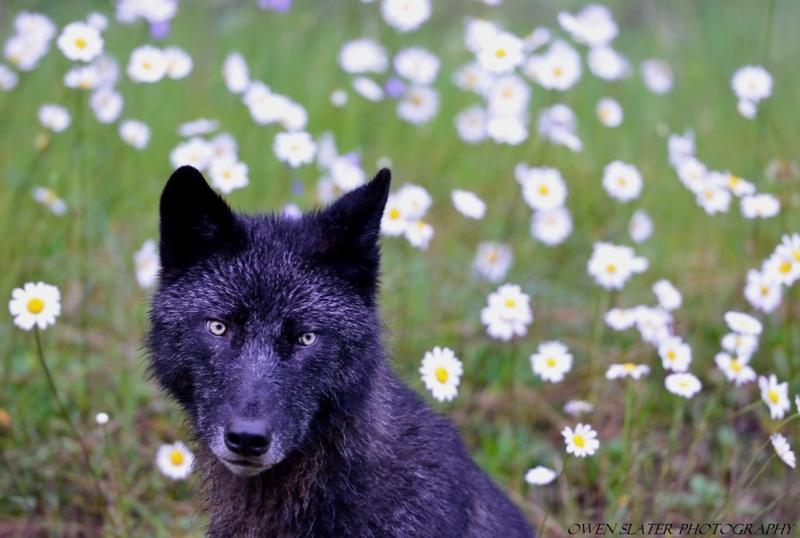 Here, one sits down in a field of daisies just long enough for me to snap off a few pictures before rejoining the pack.